Overactive bladder or OAB is a medical condition associated with the function of the bladder storage. The result of this condition is an urge of urination, all of a sudden. The urge is urge that it would be difficult to stop and sometimes loss of urine could be led, inconsistently. The problem of overactive bladder is associated and suffered by about 40% of the people. The problems, like urine incontinence is caused because of the overactive bladder for about 40% to 70%. This problem is not life-threatening and people live with this condition for many years together. The condition of the overactive bladder is embarrassing, limit yourself, isolate yourself, especially in social life. The causes that result the overactive bladder are unknown yet. However, certain general conditions of the body, like constipation, caffeine and obesity can increase the risk. When the diabetes, chronic pelvic pain or poor mobility are added, the problem become worse. After the overactive bladder problem gets started, the symptoms that are experienced by the patient, are the following. Diagnosis is done to understand the specific cause by simple and brief evaluation. It is important to understand the signs and symptoms clearly to confirm the problem. Diagnosis is basically done to exclude the possible conditions like neurological conditions or urinary tract infections. It is because these symptoms are similar to the symptoms of bladder cancer, urinary tract infection, benign prostatic hyperplasia, etc. 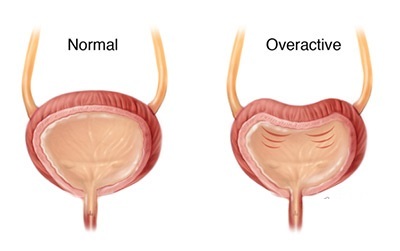 Treatment of overactive bladder is always started with the behavioural strategies, like timed voiding, techniques to hold the bladder and fluid schedules. After the management starts with this, the later treatment methods are continued if the problem is not controlled by the behavioural changes. Bladder holding techniques are done with the help of pelvic floor. The home based practices needed are the following. Bladder training is the most common and most effective treatment recommended for the overactive bladder. It does not need any kind of medication. The training includes changes done with the usage of the bathroom. The key point here is scheduled voiding, which means fixing certain times all the day and night to urinate. The schedules are more frequent during the initial stages and the interval between the visits to the bathrooms will be increased in the later stages. Pelvic floor exercise is an exercise done to strengthen the muscles that could control the urination, just like the exercises performed to strengthen the muscles of the arms, ribs, etc. of the body. The exercise is done by tightening, holding and then relaxing the muscles, which are function, while starting and stopping the flow of urine, while urination. Start it with sets of three and increase to the sets of 10. Other kinds of activities are the following. To avoid the embarrassing movements, while spending more time out, one can wear the absorbent pads so that the leakage from the bladder can be controlled. Such arrangements can be done until the overactive bladder comes into control. When the treatments like behavioural therapies do not help to relieve from the symptoms, medication has to be started. Injection of certain specific toxins is also given as a part of the treatment. This kind of medication is treated as second line treatment. There are a few people get relief from the medication, however they are effective moderately. Treatment for overactive bladder also includes certain procedures. There are many of the devices used to treat this condition. Devices like urgent PC neuromodulation system can be used. Injections, like Botulinum Toxin A done in the bladder can possibly suppress the contractions in the bladder involuntarily, through blockage of the signals of nerves. However, these resultive effects do work for nine months. For the overactive bladder condition, complex treatments like surgery or urinary catheters are not recommended.